72.50" TTT, Dejaneiro, is sired by 80.8750" TTT, JP Rio Grande, and out of 83" TTT, WS Rainbow. 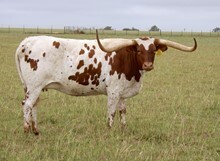 Dejaneiro has a pedigree full of horn producing genetics for success. 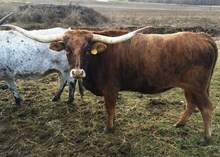 She will produce size, color, and, of course, horn. And lots of it! All of her offspring will be Millennium Futurity eligible. bull calf born 11/10/2018 sired by 79.50" TTT, TS Lone Star 22/5, a grandson of Concealed Weapon, and out of 78" TTT, SDR Rio's Dotty I. A ton of horn in this calf as well as twists and great cows.